Some of life’s challenges can be easily overcome, and some require more effort to break through. Whether it’s overcoming an illness, or finishing a difficult project, setbacks and prolonged difficulties can make us feel discouraged. At worst, we can give up before really giving ourselves a chance to succeed. When doubt, discouragement, or depression set in, and we need to re-connect to our inner creative spark and get moving again, guided imagery can help. In this unusual and colorful guided meditation, you’ll find yourself scuba diving in search of an elusive tropical fish. It’s not as easy to spot as you had hoped, and your optimism fades. Then something magical happens to help you make a shift. As the story changes, so does your attitude toward your own life. 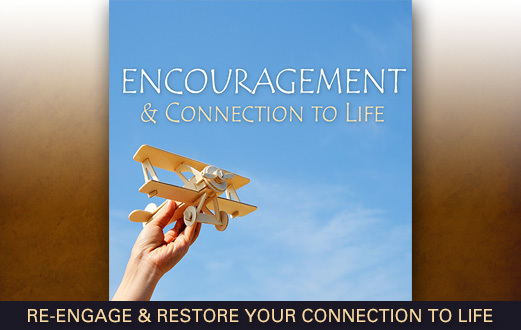 Use this program to find encouragement, re-engage, and reconnect with life. "...Imagine you’ve been scuba diving in just off the coast of a tropical island, looking for a rare fish you’ve heard about, but only seen in pictures so far. You’ve heard from the locals that you can find this fish here, right in this spot. So you’ve come to dive here every day, but without success. You’ve seen a few fish, some of them very pretty, but not the one you’re looking for. "Day after day you come and dive, and day after day you’ve had no luck. On the fifth day, you’re diving, and feeling pretty discouraged. And as that discouragement comes over you, you also begin to doubt you’ll ever find what you’re looking for. All the other times you’ve tried things and failed begin to play in your memory. And before long, you’re feeling quite hopeless, and depressed. "So you drift all the way down to the ocean floor, and lay down there, in your scuba gear. You’ve got plenty of air, but the longer you lay there, the less you feel like getting up. You’re stuck, and something needs to change. So, you inwardly say the word, “help”..."
This program is one of many on our website where we conjure up colorful settings and story content. Our purpose is lead you the listener out of a possibly negative mindset, into something brighter. We also try to include provocative sound effects when we can, to enrich the listening experience. So in this program, the added element of a certain "bubbly" sound gently tickles the mind, and encourages lift. The script for "Encouragement" was written to reach into the unconscious mind, and seed the idea of looking up and feeling better. Words make a difference. Carefully choosing just the right ones pays off in positive results. I want your experience of our programs to be as rich and rewarding as possible, and I enjoy putting a great deal of thought and care in to each one. I hope you'll find this program helpful, and enjoyable.